A friend recently asked me why he should try Paladins. Here's 5 reasons why I thought he should. A friend recently asked me whether I had played Paladins and if, in my view, it was worth playing. He had been eyeing it on Steam for some time but had never quite gotten around to diving in. We chatted for some time about why I thought he should play it and I thought, considering he was in the same boat, others might be wondering if they should as well. Here’s my five reasons as to why people should dive in. There’s no barrier of entry to Paladins. If you own Steam, you can dive straight in - right this moment. It’s quick to download (unless you’re still using a 56k modem) and you’ll be playing it almost immediately. Although you technically can buy Paladins, those who choose to go down the free-to-play route still have access to plenty of Champions by default. I will say that for a free to play game, there’s a brilliant level of polish and content here. While there’s certainly room for improvement (it is in open beta, after all) it’s in a very good state. I regularly read people make lazy comparisons between Paladins and Overwatch and yet the games are vastly different. Yes they’re both first person and yes they’re team based games, but they do things very differently. 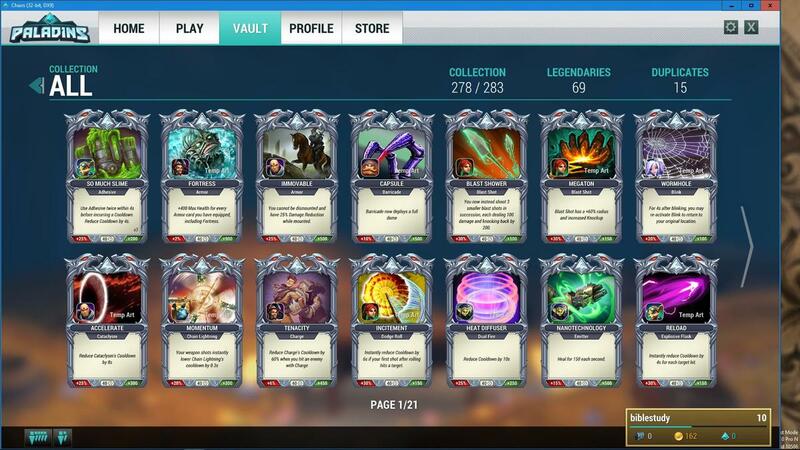 Paladins not only has loadouts (cards) but also upgrades within the game itself. It’s also much faster, has mounts, a vastly different overall pace and there’s a speed and ease to the play that’s incredibly enjoyable. There’s no suggestion from me Overwatch isn’t a fantastic game (it is) but there’s room for both and they do things well in their own way. Where my personal preference is concerned, I love the fact you can’t change Champions in Paladins and that cards and building out your deck are - alongside said Champions - a key part of its depth. 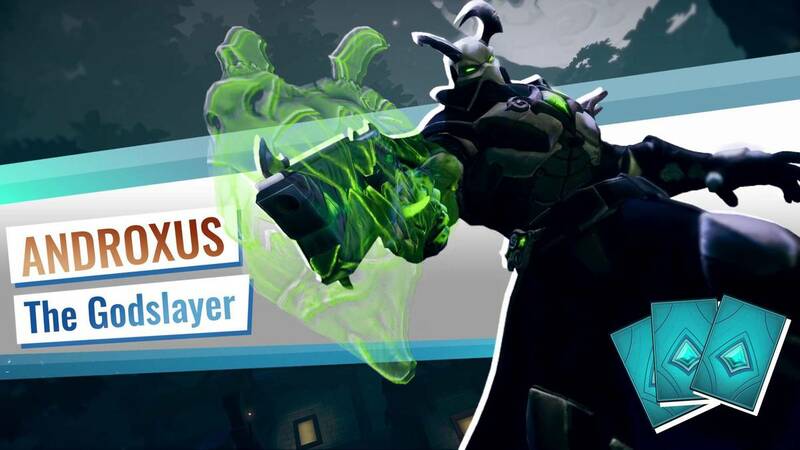 Androxus excels at flanking and has a versatile, mixed kit. Paladins’ card system has changed massively since the game was first announced. While it’s not as “active” as it used to be, your loadout remains incredibly important. Cards affect your abilities and improve them in a variety of ways. Whether it’s lowering an abilities cooldown when you secure a kill, or altering an ability directly. There’s tons of variables and it’s up to you as to how you build each Champion. Unsurprisingly Loadouts can have a huge impact on how each Champion plays and importantly, how you prefer it to play. Cards offer a significant amount of additional depth to the game that’s more than welcome. Paladins is fast. Make no mistake, the game plays at break-neck speeds. The likes of Team Fortress 2 and Overwatch, at times, feel positively pedestrian in comparison. Not only do Champions move quickly, but the implementation of Mounts also ensures that movement speed is incredibly high. The fact there’s no real reduction in mobility when firing, alongside two fast paced game modes (the Payload certainly moves along at a pace), ensures you really have to have your wits about you. I’ll admit that it took some getting used to but once you do, it’s tons of frantic fun. There are currently 18 Champions in Paladins and all are tons of fun. Some are pretty typical of the genre (Barik sits somewhere between Torbjorn and Team Fortress 2’s Engineer) while the rest are new and fresh (Ying and Grohk are personal favorites). Irrespective of what sort of playstyle you enjoy, there’ll be something here for you. When a match starts in Paladins, you’re unable to change your Champion so time and thought should be taken to your team's composition. Thankfully and based on the variety of Champions, drafting against your opponent always proves possible. Do you have a reason why people should play Paladins? Let me know. To read the latest guides, news, and features you can visit our Paladins Game Page.